* Endpoint at day 14 was significant reduction from baseline compared to placebo (P < 0.0005). † A clinically relevant reduction in group mean SBP was predefined to be ≥ 20 mmHg in the telmisartan group from baseline to Day 28. The number of cats available at Day 28 for comparison is less than at enrollment because of removal of cats for hypertension rescue or adverse reactions. ‡ For cats with blood pressure ≤ 200 mmHg. Telmisartan, the active substance in SEMINTRA, is an ARB, a class of medication that modulates the RAAS by selectively blocking receptors in the effector step of the RAAS. 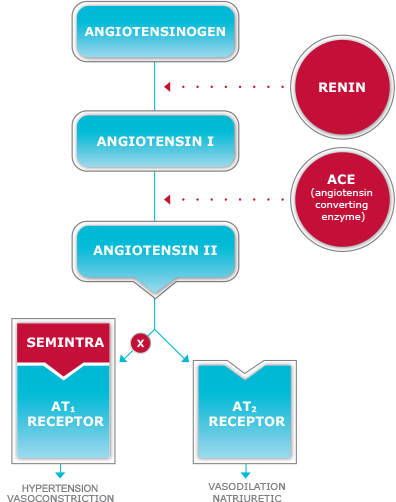 Unlike angiotensin-converting enzyme inhibitors (ACEis), ARBs do not block the conversion of angiotensin I to angiotensin II by angiotensin-converting enzyme in the RAAS cascade, thereby also blocking the activation of some of the receptor types with beneficial effects. And, unlike a calcium channel blocker, a class of pharmaceuticals that block the influx of calcium into cardiac and smooth muscle cells through calcium channels and potentially activate the RAAS, ARBs help to manage the RAAS. Chronic activation of the RAAS can be harmful to tissues, including the kidney. SEMINTRA is for oral use in cats only. The most common side effects reported in field studies include vomiting, diarrhea, lethargy, dehydration, poor appetite, and weight loss. If side effects should occur, pet owners should contact their veterinarian. Click here for full prescribing information. SEMINTRA has not been evaluated in cats with systolic blood pressure > 200 mmHg. 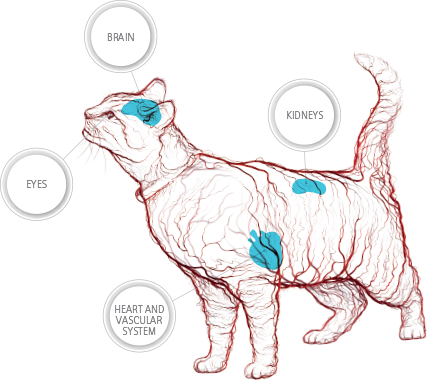 The safe use of SEMINTRA has not been evaluated in cats with hepatic disease, cats less than 9 months of age, or cats that are pregnant, lactating, or intended for breeding. The safe use of SEMINTRA with other anti-hypertensive medications has not been evaluated. Mild anemia or non-regenerative anemia has been reported. Pregnant women should avoid contact with SEMINTRA because substances that act on the renin-angiotensin-aldosterone system (RAAS), such as angiotensin receptor blockers (ARBs), can cause fetal and neonatal morbidity and death during pregnancy in humans. Not for human use. Keep out of reach of children. If SEMINTRA is accidentally ingested, contact a physician. SEMINTRA is a clear, colorless to yellowish viscous solution containing 10 mg/mL telmisartan. References: 1. SEMINTRA® (telmisartan oral solution) Prescribing Information. Boehringer Ingelheim Vetmedica, Inc. 2018. 2. Zimmering T. Ease of use of SEMINTRA and its effects on quality of life—update on cat owner feedback (“EASY Programme”) [abstract]. In: Proceedings from the 21st Federation of European Companion Animal Veterinary Associations (FECAVA); October 15–17, 2015; Barcelona, Spain. Poster. 3. Elliott J, Fletcher M, Syme HM. Idiopathic feline hypertension: epidemiologic study [abstract]. J Vet Intern Med. 2003;17:754. 4. Taylor SS, Sparkes AH, Briscoe K, et al. ISFM Consensus Guidelines on the diagnosis and management of hypertension in cats. J Feline Med Surg. 2017;19(3):288–303. 5. Maggio F, DeFrancesco TC, Atkins CE, et al. Ocular lesions associated with systemic hypertension in cats: 69 cases (1985–1998). J Am Vet Med Assoc. 2000;217:695–702. 6. Littman MP. Spontaneous systemic hypertension in 24 cats. J Vet Intern Med. 1994;8:79–86. 7. Stiles J, Polzin D, Bistner SI. The prevalence of retinopathy in cats with systemic hypertensionand chronic renal failure or hyperthyroidism. J Am Anim Hosp Assoc. 1994;30:564–572. 8. Syme HM, Barber PJ, Markwell PJ, et al. Prevalence of systolic hypertension in cats with chronic renal failure at initial evaluation. J Am Vet Med Assoc. 2002;220:1799–1804. 9. Kobayashi DL, Peterson ME, Graves TK, et al. Hypertension in cats with chronic renal failure orhyperthyroidism. J Vet Intern Med. 1990;4:58–62. 10. Coleman AE. Efficacy of oral telmisartan for the treatment of systemic hypertension in cats. In: Proceedings from the American College of Veterinary Internal Medicine; June 14–16, 2018; Seattle, WA. Abstract RRS08-E. 11. Coleman AE, Brown SA, Stark M. Evaluation of orally administered telmisartan for the reduction of indirect systolic arterial blood pressure in awake, clinically normal cats [published online ahead of print March 7, 2018]. 12. Glaus AM, Elliott J, Albrecht B, et al. Efficacy of telmisartan in hypertensive cats: results of a large European clinical trial [abstract]. J Vet Intern Med. 2018;32:577. 13. SEMINTRA® (telmisartan oral solution) [Freedom of Information Summary]. St. Joseph, MO: Boehringer Ingelheim Vetmedica, Inc.; 2018. J Feline Med Surg. doi:10.1177/1098612X18761439. 14. Williams TL, Elliott J, Syme HM. Renin-angiotensin-aldosterone system activity in hyperthyroid cats with and without concurrent hypertension. J Vet Intern Med. 2013;27(3):522–529. 15. Syme H. Hypertension in small animal kidney disease. Vet Clin North Am Small Anim Pract. 2011;41(1):63–89.